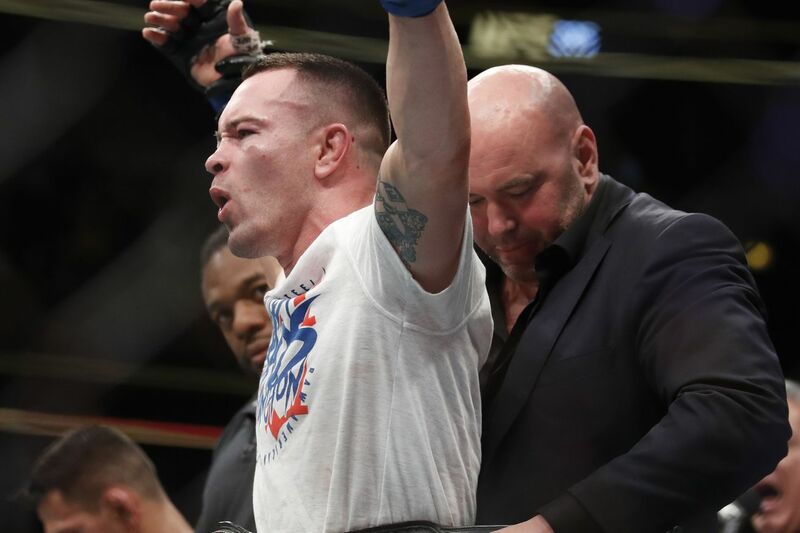 Get the Full StoryColby Covington says the Kamaru Usman fight should have happened much earlier in both of their respective careers. Colby Covington says he was devastated that Tyron Woodley lost the UFC welterweight title last weekend. Chaos said he was rooting for Woodley to defeat Kamaru Usman in his fifth title defense, which co-headlined UFC 235 on Saturday at T-Mobile Arena in Las Vegas. Usman dominated Woodley over five rounds to become the new champion, ending his two-and-a-half-year reign. Covington said he wanted Woodley to win so he could be the one to dethrone The Chosen One. It s very disappointing, Covington told Bloody Elbow. I was legitimately almost heartbroken on Saturday night. I was the biggest Woodley fan in the whole arena. I was Team Woodley all night. I wanted him to win. Covington said he preferred Woodley win on Saturday because that would have been a bigger matchup than the impending Usman fight will be. Woodley and Covington have butted heads for the better part of the past year, and that fight has been considered the most lucrative title bout for Woodley. After Covington won the interim title last June, it seemed like it was just a matter of time before he would meet Woodley. But he was stripped of the belt after he couldn t make a fight against Woodley last September Covington was recovering from nasal surgery and Darren Till got the next title shot instead. Woodley would submit Till in the second round at UFC 228. Usman, meanwhile, continued to pick up high-profile wins, including decisions over Demian Maia and Rafael dos Anjos. After the win over the former UFC lightweight titleholder last November, UFC president Dana White said he wanted to see Usman fight for the title. Covington was once again passed over. This is the fight that we built up for so many years, Covington said. There s not a lot of hype behind Snoozeman. He has manufactured beef, trying to get everybody to think there s real beef, but there s no real beef. Me and Tyron had a real f king beef. We want to kill each other, we want to leave each other unconscious in the Octagon. Covington certainly does have history with The Nigerian Nightmare, too. They rose to welterweight fame and transitioned from prospect to contender at similar times. They have similar styles, both grinding wrestlers. And they train just miles apart from each other in South Florida at American Top Team and Hard Knocks 365, respectively. Covington and Usman have gone back and forth for years. Both have wanted to fight each other at different times, but the bout has not come to fruition until now. Covington said at this point in time, the fight should have already happened. We were definitely supposed to fight earlier, Covington said. As soon as he won The Ultimate Fighter, I knew we were destined to cross paths and fight it was just a matter of time. I was already in the UFC at that time, and I was asking to fight him. Dan Lambert called Joe Silva, Hey, we want to fight Usman. Glenn Robinson was Usman s manager at the time, and he was turning down the fight. I offered to fight him three different times he turned it down every time. Covington claimed that Usman only began wanting to fight him once he started skyrocketing through the welterweight rankings. Covington also holds decision wins over Maia and dos Anjos, beating both of them before Usman did. As soon as I got a big win over Dong Hyun Kim, then Usman started calling me out, Covington said. Of course he wanted to fight ahead in the rankings I was top 10 in the world and he wasn t ranked. That s when he started begging for me. But it made no sense for me. I wanted to fight No. 4, I wanted to fight for the title. I didn t want to go backwards. The UFC is targeting the Usman vs. Covington title fight for either June or July, Covington said, but nothing has been made official as of now. This has been brewing for a long time, Covington said. We live a couple miles apart from each other. This is for state supremacy, this is for gym supremacy ATT vs. Blackzilians. This is going to be a great fight for the fans, and there s only gonna be one real champion at the end of it and it s gonna be me.